Political Banners, Signs & Stickers - Easy Online Ordering! 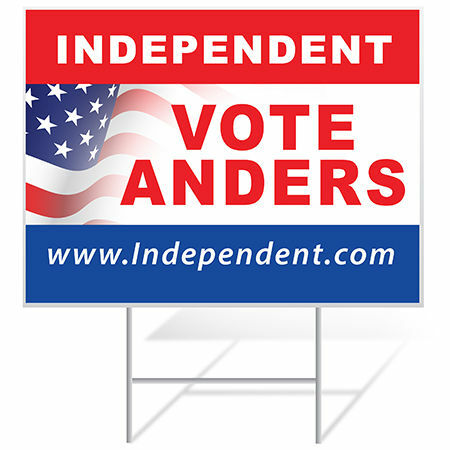 Bolster your political campaign with vinyl banners, yard signs, and decals from Banners.com! Use banners and signs to promote your candidate, political party, party platform, or anything else you want people to know about your campaign. We have lots of different products and materials available so no matter what your signage needs are, we can help you out! If you need something that you don't see listed, feel free to contact our customer service professionals! Vinyl Banners are our most popular product. We have a large selection of Political banner templates available to customize in our online designer. Yard signs are also referred to as lawn signs, or corrugated plastic signs. From bumper stickers to bus wraps, we can print any type of decals you need. Contact a customer service representative if you have questions about materials or specific applications.